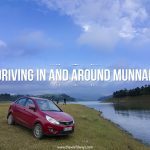 A backpack trip to Munnar in the Kerala’s own KSRTC. Traveled to and fro in KSRTC and roamed Munnar on a hired Honda Activa. P.S: The Indian Ways is what you see now as The World Ways.